Jamie Carragher analysed Chelsea's "unbelievable lack of intensity" on Monday Night Football, saying the players look like "mannequins" at times. 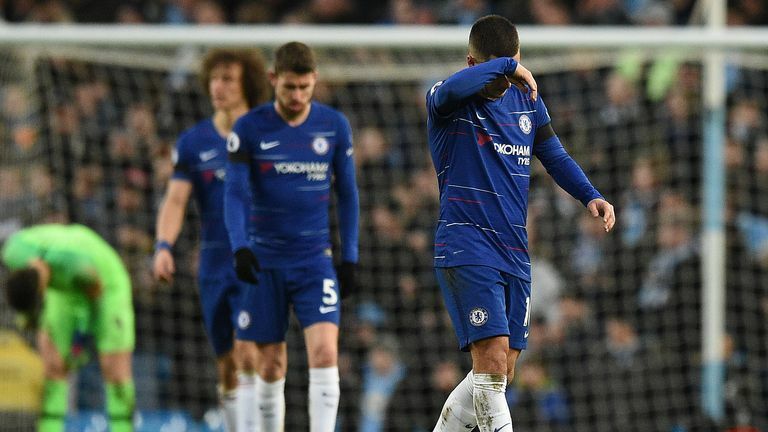 Chelsea have come under scrutiny after they were thrashed 6-0 by Manchester City on Sunday, which was their worst defeat in any competition since 1991. Jamie Carragher: "I stand by my comment about Sarri turning Chelsea into Arsenal. The reason I said it was that in the last few years, Arsenal have been rolled over in big games. There has been an 8-2 at Manchester United, 6-0 against Chelsea, 5-1 at Anfield. "What we are seeing from Chelsea now is very similar. It's not just losing big games, it's how they are losing them. "In the last two-and-a-half months Chelsea have probably put in four of the worst away performances that they have had in the Premier League. "Starting with the Tottenham game [a 3-1 defeat at Wembley] and there's a recurring theme. "The lack of intensity from Chelsea is unbelievable. As the ball comes into Harry Kane there's nobody engaging him or being aggressive. Still, it's like he's in a cage, there are five players around. If I tell you that he will take five touches and score a goal... that was in a derby game. "There's talk that with Sarri-ball they want to press high and press from the front. There's nothing wrong with that, a lot of the top teams in world football do it. But he hasn't got the players to do it. Eden Hazard is 28, Olivier Giroud, Pedro, Willian and Gonzalo Higuain are all over 30. They can't do it." "This is at 0-0 in the first minute of the second half against Bournemouth last month. "They are not a disorganised team but they make Bournemouth look like Brazil. There are six players around the ball, you'd think how are you going to get out of that? As a coach you'd be happy, but where's the aggression and the challenge? "One, two and they are out. Then why isn't [David] Luiz getting tight and making contact? "Where's the intensity? This is what Sarri is talking about with a lack of motivation. Patrick Kluivert: "It's a lack of aggression in the whole team. A team like Chelsea, one of the best in the Premier League, you need to have aggression. If you want to let the opponent see where you are coming from you need to have aggression to make an impression on the other team, otherwise they feel they can win something. The first thing is aggression." Carragher: "These players have to look at themselves and when the manager says I can't motivate the players, these are the clips he will be looking at. As a manager it's the same story. "Look at this against Manchester City. They are like mannequins. It's like a training session where nobody tackles. It's a huge game and it's early in the game. "This is unbelievable with Bernardo Silva. Chelsea have got eight players in the box. Bernardo Silva has six touches with eight outfield players in the box and nobody gets near him. "A big thing in football is when a manager comes in, does the manager adapt to the players in his squad or do they adapt to him? I don't think he has got the players to do what he wants, which is this high-energy game. "The big problem he has is that the one player he has brought in to implement his style, Jorginho, is the one that everyone is saying is the problem."